Nice touch! I love this program already. Interesting. Is this intended as a replacement for both CMedia and ASUS’s control panel? The revision currently available for download (0.9.33) doesn’t have a direct way of changing the card settings without modifying a profile and applying it. But the version I’m using and testing internally has a new menu called “Real time settings” which allows the user to directly affect the sound card like the official control panels. So, if you don’t need one of those settings that aren’t currently supported by XonarSwitch (i.e. moving around the speakers for Virtual Speaker Shifter or choosing the room for Dolby Headphones etc) you will certainly be able to use the new revision as a replacement for CMedia and ASUS’s control panels, once I release it. That is actually a good idea since I use them on occasions (which is becoming more frequent now). It’d be easier for me to switch between speakers and headphones. Ah, but there’s no way of selecting headphones as my layout in the current revision. Are the settings from Sample Rate and below are disabled on purpose? Do you have AEC enabled by any chance? That forces output on 2.0 speakers and disables most options. Headphones should be available on all models. If AEC is off and still they aren’t available then it’s a bug. I enabled AEC through the script you provided. I’ll try switching it off. 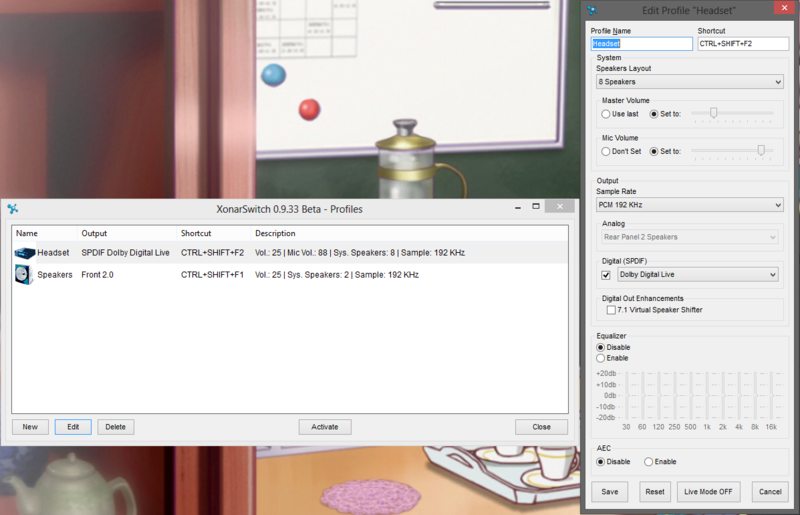 Or simply disable it from the profile editor: double click on XonarSwitch tray icon to open the profiles window. Click on new. If AEC is active on your system, it will be active on the profile editor as well. Click on Disable in the AEC section and the options that were disabled will become available. Choose headphones as your analog output and whatever else you need and then save the profile. When you will switch to that profile, AEC will be disabled and the other options you have chosen will be loaded. I don’t see any section containing AEC. Am I missing something or am I supposed to activate it through your script beforehand? According to ASUS, some models (Essence ST/STX, DS, DSX, Xense) lack the voice DSP needed to have full AEC functionality and therefore the AEC section is absent when XonarSwitch runs on those cards. For initial testing I decided to stay on the safe side and follow what ASUS say, but if there is evidence that in all or some cases it’s just marketing, and a looser implementation would work anyway, I’ll certainly change things. That’s one of the purposes of beta feedback. So what’s your experience in enabling AEC via script and using it on your model? Does it work well? It’s the DSX. It worked, but only a little. I tried recording with the same music in the background with AEC on and off. I noticed that there’s only a very little difference with AEC turned on. The music is still there but not as loud as with AEC off, and the amount of the music cancelled is very little too. I am very disappointed with ASUS’s take on this. Even Realtek is doing a lot better job than this. Their AEC and noise reduction worked very well that I don’t even need to bother wearing headphones (tested with the same method as above and almost all sounds are cancelled). I wanted to go back to using my onboard Realtek, but since I already got this, it’d be a waste. Do you think it might be possible to implement AEC on this card (and the models you mentioned)? It is actually done through the hardware or a software implementation? I don’t know how much of AEC is done via software and how much via hardware at the driver level, but it’s not something I can control. At best I could achieve the same unsatisfactory results you get from the script. The only advantage would be that AEC gets activated when you switch to the AEC profile, without having to stop your playback, but it would work as bad as it does now. Your card doesn’t support Dolby Prologic IIx, and one thing I know is that on my hardware (DX), when you activate AEC the card uses a specific Prologic Profile that isn’t used normally. That’s also what XonarSwitch does. That could be one of the reasons AEC isn’t available in the ASUS control panel of the DSX and, lacking any detailed technical documentation, that’s why I chose to start by mimicking the ASUS control panel. On different models like the Essence ST/STX and the Xense though, which AFAIK have access to Dolby Prologic, it could turn out that AEC could work flawlessly and it’s only disabled for some weird marketing reason. That fixed it, thanks. Is there any other options than AEC so that I keep the outside noise suppressed? I frequently use my mic for online gaming and the sound of fans actually somewhat bothering my friends and sometimes they can’t hear me well. It’d be great if you could implement those functions (AEC, etc.) through XonarSwitch. The two control panels (CMedia and ASUS) implement AEC differently. The CMedia version is less invasive, while the ASUS one disables everything when you activate AEC. Since I don’t have access to the platform SDK or documentation I’ve chosen to be more conservative and do AEC “ASUS style”. If there is evidence that AEC works well even leaving the other options enabled I might change things in the future. Personally, I leave AEC off and enable noise reduction in TeamViewer, which works quite well. I don’t know about other VOIP software. Ah, that is very expected of ASUS. Well, seems like the owners of ST(X) and Xense are pretty lucky if you manage to get it work for them. I might just have to live with this and stop using speakers when talking through the mic. I just wish there’s a better alternative, say, like a noise cancelling mic. Just an update (it might not be related to the drivers or AEC or anything). Upon restarting my computer, I noticed that the noises from my speakers are cancelled even when there are sounds (at the usual volume of the speakers) but my mic volume became a lot lower that almost can’t be heard. I had to speak loudly for them to hear me. It might be my mic though, I think I want to get a new mic, and see how it performs. Perhaps a cheap clip-on mic will do. Well, that certainly sounds — no pun intended — very handy. Any chance it’ll support the D2? On paper supporting the D2 / D2X shouldn’t be too difficult. At this point I don’t have any reason to think the D2 / D2X would require different commands than the other cards, unless they have some option or parameter that isn’t present on other hardware. So why isn’t XonarSwitch currently supporting them? The fact is, there’s a reason if the official control panels enable or disable certain options depending on what system speakers / analog output layout is selected. Some wouldn’t work, so inside the profile editor I have to mimic the behavior of the official control panels for the specific card model. For other models I was able to gather data about the behavior of the control panel in various situations, so I could support them even though I couldn’t directly test my app due to having a different hardware. That’s left to beta testers to do. I wasn’t able to do the same for the D2 / D2X because unlike other cards they can use both Dolby and DTS and that affects analog and SPDIF out options in a way that isn’t found on other models. If you or someone else with a D2 / D2X wants to cooperate and give me the info I need, I will certainly try and support the hardware. In case you are interested, you can contact me using an e-mail address I can reply to. With XonarSwitch running, right click on its tray icon and then on the “About XonarSwitch…” menu, which should be enabled even if your card isn’t supported. Then click on my name. If the name isn’t highlighted it’s because of an anti-spam feature: close and reopen that window a couple times and it should be highlighted. Just installed the app … So far so good .I will report anything unusual so this can become pretty app.. Thanks for it..
It’s working for me. It could be a temporary routing problem from your location. Try again later and you should be able to download. I can’t believe how perfect the timing of this is. Not even 12 hours ago, I started using the SPDIF out for a gaming headset I bought, and was expecting it to be a pain to swap from speakers to SPDIF every time I was in or out of a game. Thank you! LE: Ahh, it seems I’ve run into some problems. When attempting to swap output from analog speakers to SPDIF, the change is not being shown in UNi Xonar, and no audio is being produced from my headset. Even first setting the default playback device in Windows to SPDIF does not cause the program to switch (Though it does prevent me from activating the speakers profile). 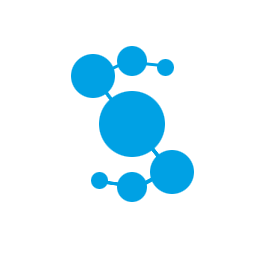 How I am reproducing it: Create a profile that uses SPDIF output, attempt to switch to profile. You didn’t say what gaming headset you are using, but since the problem is with SPDIF output I suppose it’s something like the Astro A50. Go back to the windows audio panel and set Speakers as the default output device. It’s counter-intuitive, since you want SPDIF output, but it’s necessary to circumvent a limitation about how many channels you can have in windows in a SPDIF output. Then in XonarSwitch create the profile for your Headphones. Analog output: rear panel 2 speakers or Front Panel 2 speakers depending on where they are connected. When you switch to the first profile you should have SPDIF output and no sound from your analog connectors and vice-versa when you activate the second profile. Sorry, didn’t expect my headset to affect it, but it’s an Astro a40 via MixAmp. The setup you described in your steps is actually what I have currently, and it is definitely not swapping to the SPDIF output. Upon swapping to the headset profile I checked to see where sound came from, and it was still being produced from my speakers. The only change I can see being made in UNi Xonar when swapping profiles is that it’s changing between 2 channel and 8 channel input, which is what I have defined in my speaker and headset profiles respectively. External changes not being reflected in the ASUS control panel, with the exception of Audio Channels, is a limitation of the ASUS control panel but the settings are still being applied. If you close and reopen the ASUS control panel immediately after switching to a different profile you should see the changes reflected. About the swap to SPDIF not happening, are you positive you chose “Dolby Digital Live” and not “PCM” in the SPDIF combo box while defining the Astro profile? I ask that because on my card, a DX, which besides a PCIE to PCI bridge is practically identical to yours, when I switch to a Dolby Digital Live profile I get no output from the speakers, so it seems something is different there. With PCM selected the audio is still being sent to the speakers but AFAIK the Astro MixAmp can’t use PCM. Another way to make sure your Astro profile uses Dolby Digital Live is to check the profiles list. It should have the same icon that Windows audio panel uses to identify SPDIF outputs, and not the normal speakers or headphones icon, like it happens if SPDIF is active but the format option is set to PCM. Also, the output column should say “SPDIF Dolby Digital Live” and not “Front” or “Rear” and the speaker format. 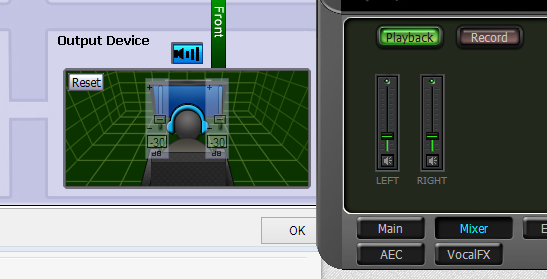 http://i.imgur.com/DPowXYr.png Here’s a screenshot of my current profile settings for the headset, and the main window. I double checked that audio was still being produced from my speakers by changing profile, opening Zune and playing a song, closing it, changing profile, and opening Zune again. Regardless of what profile was selected, sound was still produced from my speakers. The profiles are correct, Can you please contact me via e-mail? I need you to check some things for me and maybe test some new version to see if it solves your problem. XonarSwitch’s tray icon -> right click -> About XonarSwitch -> click on my name. If it’s not highlighted try closing and reopening the about window until it is: there’s anti-spam feature that might kick in. Good program!!! Thanks and sorry for my English. My card is Xonar D1. One question: is the FlexBass option realized in profiles? I can’t find it. My headphones connected to front panel, and they sounds bad with FlexBass is on, but 5.1 system sounds much better, if FlexBass is on. It’s very uncomfortable to switch this option every time i using headphones. FlexBass is currently not supported, but I could look into adding it. From my point of view, the good thing about flex bass is that it’s present on basically all the Xonar models I already support, so it doesn’t force me to handle a lot of different scenarios. I’ll see if I can figure out the driver commands for flex bass and let you know if you can expect to see it in one of the next revisions or not. OK I should be able to add FlexBass in a coming release. Keep in mind that since it’s a feature request, in this phase it has lower priority than bug fixing, so I don’t have an ETA. It’s a good news! I think this feature will be usefull. This feature would be great. Switch works fine on XP x64, but i really need FlexBass. I often switch from Headphones to 5.1 speakers, which can’t redirect bass from 2.0 sources to subwoofer by themselves. That is very cool, any chance it will be opensource at some point ? Sorry but that’s not going to happen. XonarSwitch shares a lot of code libraries with commercial products I write for a living. Note taken about your feature request. As always, keep in mind that even if I decide to implement it it might take a while. Few requests and questions: First would it be possible to make a hotkey combo that cycles through profiles? I have a griffen powermate for volume control. I can emulate a keypress by pushing down on it. I would like pushing it to just cycle from speaker to headphones and back again. So for instance it would be great if I would just set ctrl-shift-f1 to cycle through settings. Also, for some reason in chrome when I use this program to change profiles I loose sound. Other apps retain audio and switch output just fine. I’ll think about the cycling keyboard hotkey but I can’t promise anything. About the sound loss in chrome: do you have an explicit speaker layout in those profiles? When you switch to a profile which changes the system speakers, for instance from 2 to 8, the device is invalidated by the operating system and typically flash doesn’t recover from that kind of error. If that’s the case, you’ll see that changing speakers layout from the ASUS control panel or the system audio window will lead to the same result: it’s just how the windows audio layer works since Vista. If you don’t need changing the speakers, leave the setting to “Don’t change” and the output shouldn’t stop anymore. Thanks, I realized my problem with the speaker settings shortly after posting the comment. Thanks for the followup though. Also, thank you for considering the cycling hot key and getting back to me. thank you very much, for your work, i hope you keep improving the program, and wish you the best of luck. Thanks again godsend stranger. Do you plan to support C-media based cards other than Asus ones. For example, I have an X-meridian (first version) card but the program says there is a unsupported Xonar card in the system (I’m using the Unified Xonar drivers). It depends on how different their features are compared to ASUS models. If your model is completely identical to an Asus model and the control panel behaves exactly like the one of that ASUS card, let me know and I can try and see what happens by enabling support. If it’s different it depends on how different it this. Honestly I know nothing about non-ASUS C-Media cards, so I need info to better understand the situation. Thanks a lot for your efforts. I’m affraid the regular Asus Xonar control panel does not work, just the regular C-media control panel that it is included in the Unified drivers. Does it have a front panel connector? The reason the ASUS control panel doesn’t work it’s purely because it looks for ASUS models and of course in your case doesn’t find one. If the driver responds to the same commands we might be able to do something. The Codec support is similar to the D2X but it has an added front panel connector. If I can get to support the D2/D2X, then we can try and see how the app behaves with your hardware. Don’t expect too much though. I have a feeling we’ll run into problems. Very nice program! Keep the good work going! 😀 And please support D2/D2X . I use a D2X and can provide u infos if u want / need. You can contact me by email. After Giulio saves your address I will delete it from the comment as it can be grabbed by spam bots. Thanks a lot Carved. Was in a hurry and missed to direct contact him under his email.Sorry and thanks again!Totally agree with you! Best regards. I don’t know if this is a bug or just something on my end. But switching the Output from Rear Panel 2 Speakers to Rear Panel Headphones is not working for me. It just stays on the Ouput which is set by CMedia or Asus Control Panel. Everything else works. So if I understand correctly, you set Rear Panel 2 speakers in the ASUS or C-Media control panel and then use XonarSwitch to activate a profile which has rear panel headphones as its output and it doesn’t work? But if you come from another type of output it works? Yes, this is not working. The problem with Windows 8 should now be fixed. Switching (no pun intended) subject, I might have a couple of questions to ask you about the DG’s jack sensing feature. If you want to contact me, I might be able to implement a feature that would cause XonarSwitch to automatically switch to the last profile used for the same output when you plug / remove a jack in the front panel connector. I can’t promise anything: the feasibility depends on the answers I get on the subject, but it might be possible. The app is all in that exe, so you delete the exe and it’s gone. for x64 versions of Windows. If you aren’t comfortable with working with the registry yourself, wait for the next revision: I’ll add a way to delete the key from inside XonarSwitch so that then you can just exit the app and delete it and nothing is left on your PC.